Not a pumpkin spice latte in sight! If, like us, the arrival of fall for you means long walks in the park, kicking your feet through amber leaves, and sipping from a flask of hot cocoa, then you’re in the right place. Here we have five easy to prepare recipes, which are perfect for blustery days. Or even better, recipes that you can leave to simmer on the stove whilst you go on a ramble, letting the flavors develop and warm as you’re out in the autumnal chill. Enjoy! Now, here’s a dish that’s easy on the eyes and your taste buds. Silky, creamy risotto is always a perfect winter warmer, made even better when flavored with white wine, shallots and Hokkaido pumpkin. Check out our basic risotto How To and become a risotto pro. Pumpkin doesn’t always have to be the star of the show, but adds incredible flavor when combined with other ingredients. Our sweet potato curry with pumpkin, fresh herbs, cashew nuts, and garlic has everything you need for a flavorsome fall recipe. Be sure to watch our homemade curry paste How To for which the uses are endless. Say goodbye to chicken noodle and hello to our velvety, nutritious Hokkaido and ginger soup with candied pumpkin seeds. Don’t be put off by the candied pumpkin seeds as they’re ready in less than 15 minutes! Forget the canned, preserved purée, you’re going to do this yourself! 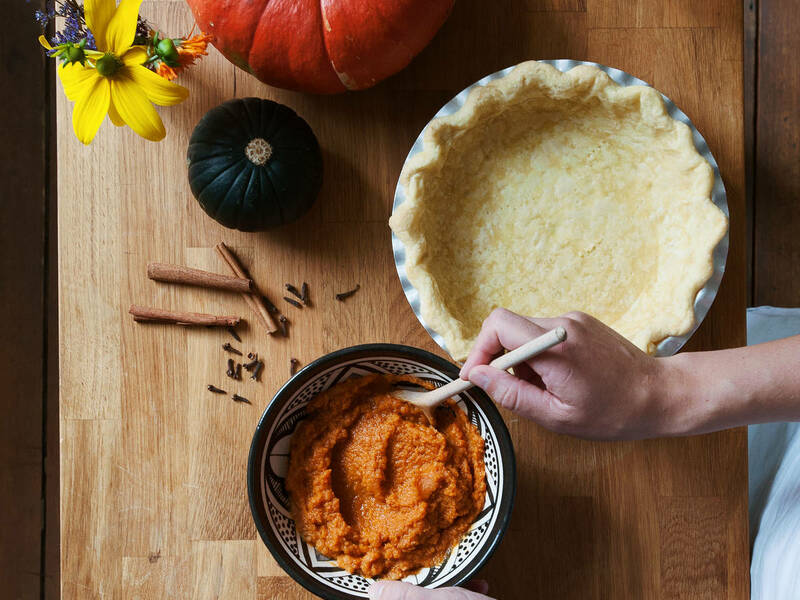 With 6 autumnal spices and a fresh piecrust, you’ll be salivating as soon as you smell it baking in the oven. After checking out our pie crust How To you’ll have no excuse not to make delicious pies every day! We couldn’t do a collection of pumpkin recipes without mentioning pumpkin spice could we? This rich, spiced cheesecake with a molten chocolate sauce is exactly what you’ll need after a winter stroll, along with a latte of course. Learn how to make a ganache and endlessly broaden your chocolate dessert horizons.